The CSJK-306 is our Class 3 Premium Black Bottom Bomber (ANSI 107-2010). 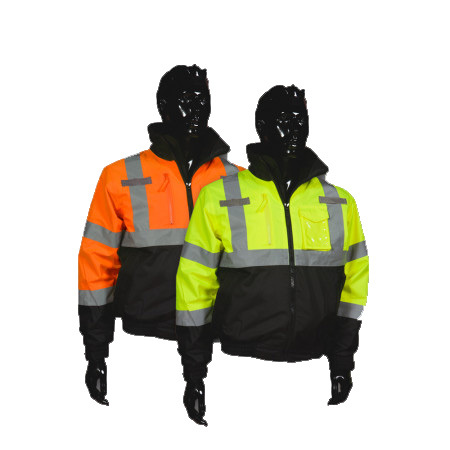 It is made with a waterproof polyester shell with taped seams, black bottom front, 2” reflective tape, adjustable cuffs and a heavy duty zipper closure. Main features include removable zip out contrasting Polar fleece liner, a roll away hood and a personalization access zipper. Also, it has 2 mic tabs and 3 pockets (2 deep side waist pockets and a cell phone/clear ID pocket). It is available in both orange and yellow with generous sizes from medium to 5xlarge.